Faced with a staffing shortage, Daniel Small admits he failed to get permission to hire paramedics at 'double time,' then falsified payroll forms. 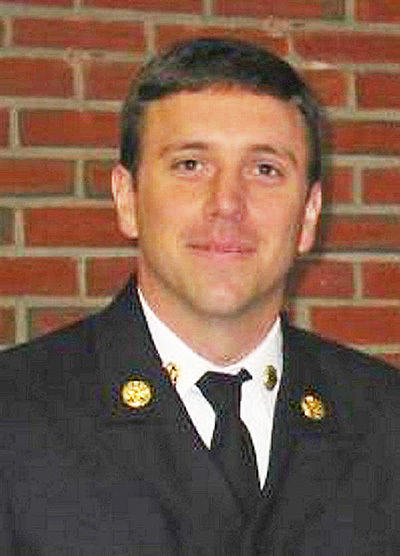 Daniel R. Small, Cumberland’s fire chief. Cumberland Fire Chief Daniel R. Small was suspended without pay for five days this month after he offered paramedics extra pay to work hard-to-fill weekend shifts and doctored payroll records to account for the additional compensation. Small was suspended for five work days from Aug. 9 to Aug. 16 as a penalty for “deliberate falsification of payroll forms” on June 28 and July 7, according to an Aug. 9 letter from Town Manager Bill Shane to the fire chief. Small said he scheduled two paramedics to work the weekend after the Fourth of July, promising them “double time” or double pay to cover shifts that he wasn’t able to fill otherwise. One paramedic worked 24 hours on July 8; the other worked 12 hours on July 9, Small said. Small then submitted payroll records indicating that the paramedics had worked additional shifts on other days when they had not, he said. In total, the paramedics were paid an extra $695 for shifts they hadn’t worked, at the regular rate of $16.32 per hour, he said. Small noted that the town budget that started July 1 allows him to hire paramedics at double time for holidays, but he failed to get permission from Shane to stretch the new policy to the weekend after the Fourth of July. Shane noted that the $1,000 in salary that Small lost during his suspension more than covered the additional pay he gave to the paramedics. Small works 25 hours per week overseeing an on-call fire department that provides full-time paramedic and EMT coverage by hiring local personnel on a per-diem or daily basis. He also works full time as a lieutenant in the Portland Fire Department. Small and Shane acknowledged that a regional shortage of paramedics makes it difficult to fill shifts during the summer, especially on or around holidays. Neither would name the employees who received the extra pay or say how Small’s infraction came to light.